Loved Prudential RideLondon FreeCycle 2017! The Prudential RideLondon FreeCycle 2017 was so much fun! Glad I went for the second year in a row! Even in the rain, everyone was having great fun! I am already looking forward to going again next year! Cycling around London on fully closed roads is so much fun!!! Check out the route, I took, which also includes the cycle from Kings X station, on open London roads @ www.strava.com/activities/1107255648. Oh and sorry, no photo at all! Since all my mates let me down! They only had a years notice, but till could not find the time! Maybe, I need to give them 10 years notice! Ethan throws himself into work. Jez faces a harrowing incident. Duffy mentors a pair of school girls who are observing an hour in the department. Documentary looking at how the island community of Orkney, located off the north east coast of Scotland, copes with the onslaught of tourists from cruise ships. Part of BBC One’s Our Lives strand. A love story in two films charts the very different challenges to happiness for Michael and Thomas in the aftermath of WW2 and to Adam and Steve in the present day. British Army captain Michael Berryman falls in love with war artist Thomas March in the chaos of the Italy campaign, but can their romance be allowed to endure when the war is over? With homophobic hate crime a daily occurrence and on the rise, this film takes a look at the issue, hearing from the victims, their families and the police. What makes someone attack another person because of their sexuality? How do victims deal with these unprovoked assaults? A chorus of LGBT people describe the attacks on themselves and recite a litany of the abuse that they have received, simply for being who they are. More4 celebrates Yorkshire Day by screening programmes with a connection to the county, including the latest episode from this new series, which explores what it is like to live and work in England’s biggest expanse of protected countryside – in the national parks of the Lake District and the Yorkshire Dales. In Grasmere, Michelin-star chef Kevin Tickle goes foraging to cook up some local dishes at his Forest Side restaurant. In Wensleydale, gamekeeper David Hutchinson readies the estate for a shoot. In Middleham, horse trainers Micky and Gemma prepare for a big race at Wetherby. And a Dales-based all-female band of potholing pensioners take on one of the most dangerous underground cave systems in Britain. The Five-hundred-meter Aperture Spherical Telescope, or FAST, is the world’s largest radio telescope. Hear how history’s pioneers made it all possible. Learn about the ambitious construction of Kansai International Airport in Japan, which is built on a man-made island and can withstand destructive natural disasters. 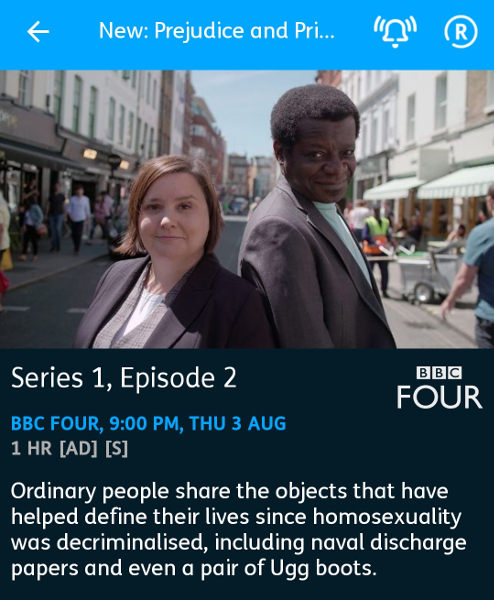 Presented by Stephen K Amos and Susan Calman, this series features LGBTQ people from across the UK as they share the objects that helped define their lives during the transformative 50 years since the 1967 Sexual Offences Act partially decriminalised homosexuality, offering lesbian, gay, bisexual, transgender and queer people the opportunity to start living openly for the first time. In episode two, these crowdsourced artefacts include a copy of the controversial schoolbook Jenny Lives with Eric and Martin, naval discharge papers, even a pair of Ugg boots. We meet the nun-impersonating freedom fighters the Sisters of Perpetual Indulgence, the writer behind TV’s steamiest lesbian kiss and a Muslim man who set up an LGBT support group for Southeast Asians. Ranging over the past 30 years, this was an era when public acceptance of homosexuality overtook the government’s – a time when many celebrities came out and stood up for LGBTQ rights. London’s newest rail network is a project of staggering proportions, with 10,000 personnel working across 40 sites and on 118km of track. Hear the story of Crossrail. The double Bafta-nominated series continues live on Friday nights for the 11th series with its unique brand of irreverent satire and sharp topical comedy. Hosted by Adam Hills, Alex Brooker and Josh Widdicombe the show examines the biggest and most entertaining news stories and rounds up the main talking points of the week. Each show, they are joined by a live audience and guests from the worlds of comedy, entertainment and politics to help dissect the week’s events. Marvel at the sheer brilliance of the Maglev Shanghai Train, the world’s fastest commercial train which can reach speeds of over 400km/h – even with leaves on the line.